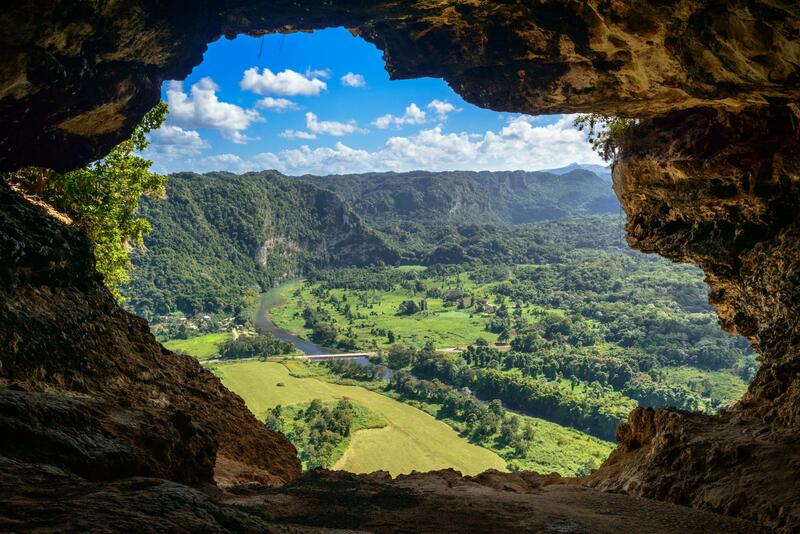 For twenty years or so, I’ve been telling The Kid about Puerto Rico. As a child, I lived there for a few years, and it was kind of totally awesome. The base we lived on was tiny. I knew every family in every house. But the flip side of all this familiarity was that everybody knew me right back. It was impossible to misbehave in public. If I did something dumb or dangerous, reports got back to my house before I did. Beaches were everywhere. Survival beach was closest; just a short but risky hike down the side of a moss-covered cliff. Kids were forbidden from going on their own, but I probably don’t have to tell you that it was one of those dumb and dangerous things I regularly did. We had our own horses, explored ruins, swam with exotic fish and climbed countless trees. But one of the very best things about Puerto Rico was the food. Just like our own revered pit masters here in North Carolina, there are certain people on the island that have a mystical connection to pork. A whole pig is either split in half and cooked over hot coals or cooked in a box, called a Caja China. It’s a pig pickin’ set to salsa music. On holidays many families have pernil, a slow roasted pork shoulder. The outside gets brown and crispy, and the meat is moist and falling-apart tender. While green, they act as potatoes in the Puerto Rican diet. Fried, they’re heavenly crispy disks called tostones. When mashed they become an insanely delicious food known as mofongo. 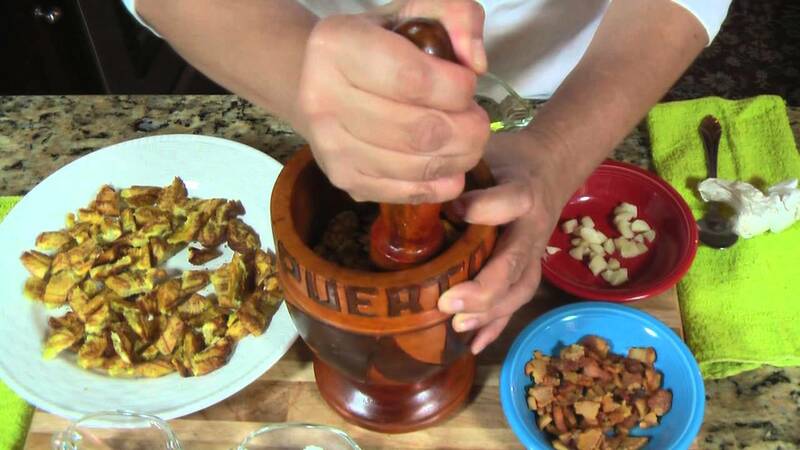 It’s made in a mortar and pestle called pilón and maceta. And then, there’s yuca, also known as cassava. It has to be cooked, because eaten raw, your body converts it to cyanide. Even cooked, some folks can’t tolerate it, and results in not death, but a pretty nasty upset stomach. Which brings me to a delicious meal The Kid and I shared yesterday. The Kid told me months ago about a restaurant called Tropical Pickin Chicken. They have locations in Wake Forest and on Capital Blvd, in Raleigh. They have different types of Caribbean fare, with many dishes from Puerto Rico. It’s a little hole in the wall set in a sleepy strip mall. But the cozy atmosphere and authentic, delicious food made me feel like I was sitting in an abuela’s (grandmother) kitchen being stuffed full of her amazing cooking. Brittany, the owner’s daughter was our adorable culinary guide. We had mofongo, covered with succulent pernil, topped with onions (which The Kid, an avowed onion-phobe devoured). It was served traditional style, in a large pilon. A small order of their delicious yellow rice and red beans was more than enough for the both of us. And we had fried yucca. Brittany told us how they prepare it. Make garlic oil. Mix mashed garlic, salt and pepper into cup of oil. Cover and refrigerate at least 24 hours. Place large heavy pot on medium-high. Fill with 2-3 inches of oil and bring to 350 degrees. 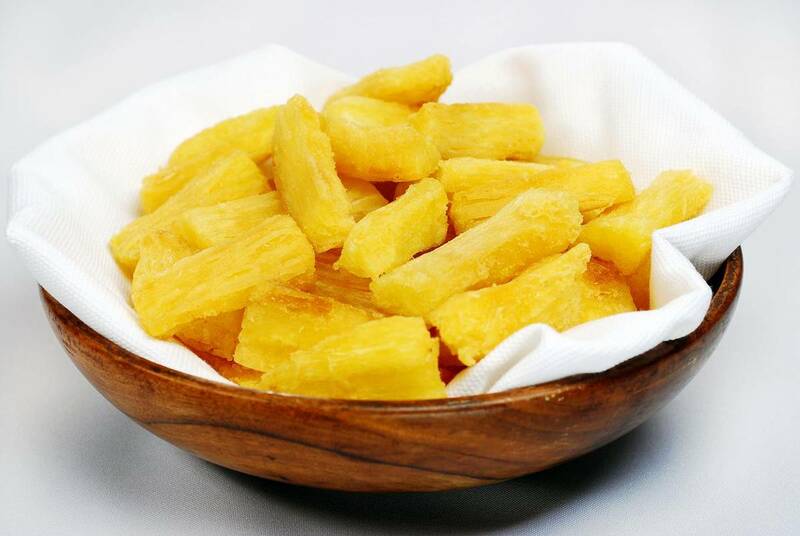 Peel yuca and cook in salted boiling water until tender. Cut into approximate size and shape of steak fries. Cook in oil until golden-brown. Remove and place in large, shallow bowl. Drizzle 1 ½ tablespoons of garlic oil on top, and toss until yuca is well-coated. Serve hot. If you’d like to see everything they have to offer, the menu is on the Grubhub website. Which means they deliver. But I’m pretty sure no matter how hard I beg, nobody’s making a 30 mile trek to bring food to me in Durham. So, until they change their minds or open a spot closer to home, I’ll be burning up the highway for more of that home cooking just like my abuela would have made for me if I’d actually had a Puerto Rican abuela.